ALIQUID: ALIQUID Lacquer's First Fantastiversary + Giveaway!! ALIQUID Lacquer's First Fantastiversary + Giveaway!! Can you believe it...one year ago today I opened my Etsy shop and started selling ALIQUID Lacquer! That means today is my anniversary...no, my FANTASTIVERSARY!! There is going to be so much fun stuff happening in the next week and a half, so keep reading! First off, I want to say thanks to everyone who has bought my polish. It's been amazing to see people get excited about something I made! That really hasn't happened much before in my life, since I've always been a "thinker" rather than a "doer". And a giant thank-you to the awesome bloggers I've gotten to work with over the past year! I've learned a lot owning a business, but one unexpected thing that I realized is how each person has their own way of using nail polish. I was genuinely surprised at first that a polish that is opaque in two coats for me might need three coats for someone else, or that someone added thinner to a polish that I thought was the perfect consistency. I've really had to look at my polishes with an objective eye, which can be difficult when dealing with something that is so personal. But I think that has made me a better indie! Anyway, on to the fun stuff! Anniversaries are the perfect time to reflect on the past year and make resolutions for the coming year. I thought about my struggles as a new indie brand and created three polishes to remind me of the qualities I'd like to foster in myself! Artsy: A coral crelly with various shades of turquoise, yellow, purple and grey matte hexes. It can be tough sometimes to stay creative when inventing new polish shades. In the next year, I want to broaden my horizons and approach polish making from a fresh perspective! Dogged: A brown scattered holographic polish with coppery red flecks and a blue sheen. Being a new indie can be discouraging, especially if you compare yourself to older, more successful brands. In the next year, I will keep believing in my own talents! 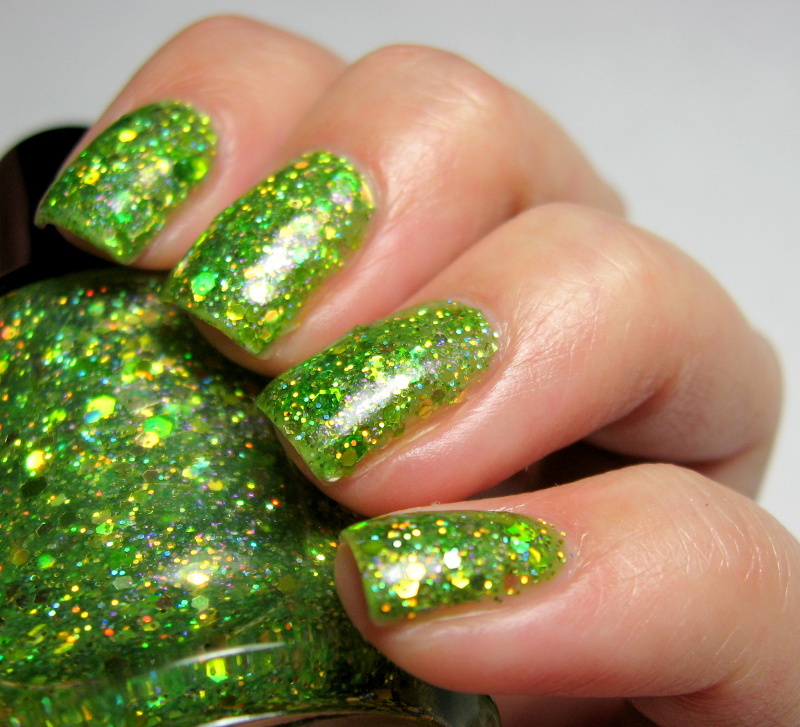 Gregarious: A lime green jelly filled with holographic and iridescent green, yellow and gold glitter in multiple shapes and sizes, plus magenta flecks. Running any business requires one skill I'm not great at: talking to people! I have had to leave my comfort zone many times this year. In the next year, I promise to stay open and approachable to customers and the nail community at large! I also have a delicious new lip balm scent: champagne frosting! I seriously love this one, you guys. So there will be tons of stuff happening now through Cyber Monday (Dec. 1)! Most importantly, lots of sales!! every day there will be a different sale at the shop--check back each day! there will be an even BIGGER Black Friday/Cyber Monday sale! occasional flash giveaways on our Facebook page! you can enter my nail art contest on Instagram to win a $50 gift certificate! And oh yes, here's a giveaway for you right now!! This giveaway is for one set of the Fantastiversary trio, and it's open internationally! You must provide your email address to enter. All other entries are optional. One of the entries asks you to fill out a customer survey. You can do this even if you haven't bought anything from ALIQUID Lacquer. At the end of the survey, you'll get a password to enter into the Rafflecopter for verification. Giveaway ends Dec. 1 at 11:59 PM EST. Winner will be notified by email and must respond within 48 hours, or a new winner will be chosen. Congrats on your one year! And hopefully many more to come! Congratulations! I'm happy to have been one your customers. Keep up the amazing work! I shared on Pinterest- I hope that's ok! Congrats on your 1 year anniversary...it's hard to believe it's only been a year, given how many polishes you've released! Congratulations on your first year! Your fantastiversary trio is stunning! I just received my first polish from you today. It is so beautiful! I can't wait to use it tonight. Congratulations On Your First Fantastiversary Year ! Awesome Giveaway Thank You For The Chance! Congrats on your one year!! That's so awesome!! Wow! Congrats on one year!! Thanks for the great giveaway! Artsy is way cute!